Looks like Microsoft’s woes regarding their web browser are far from improving or showing any signs thereof. It was reported recently that Google’s Chrome browser is slowly but consistently eating up IE’s market share and is showing the most growth. Now latest figures from StatCounter have revealed that the situation is much worse than imagined. StatCounter’s data shows that Internet Explorer has dipped below the 50% mark in its global share of the Internet browser market. 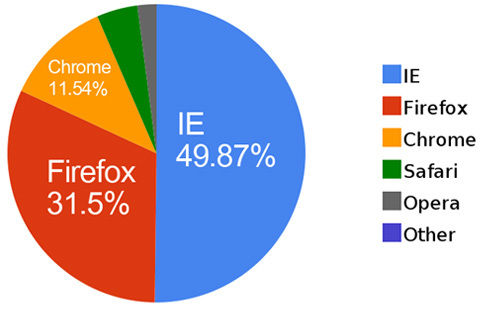 It was at 51.34% in August this year but by the end of September, it was holding on to just 49.87% of the browser market. IE also shows a drop of nearly 10% year over year in StatCounter’s data. This must have sent alarm bells ringing over at Microsoft as this is the first time in its history that IE has fallen below the 50% mark. The reasons are pretty obvious as Firefox has shown some major growth in the last few years with its handy and easy to use functions and then came the Chrome browser with its speed and neat tricks from Google. It’s surprising that IE is continuing to lose its market despite the IE 9 launch recently which promised to solve and address all the problems and complaints from users. It looks like that MS is a little late in coming up with these solutions and users have moved on and gotten used to their new browsers. It remains to be seen whether the downfall of the IE continues or shows some stability by some miraculous trick pulled off by Microsoft.